I love this plant. I don't know how to buy more or divide it, since I don't know what it is. Can anyone help? this is early spring most everything but the daffodils are just poking out of the ground. But this looks like it is in the middle of summer and just gets nicer all season long. Does it have a yellow daisy shaped flower? I'm guessing some form of ligularia. Look at the second photo from the link below. I think hendi_alex is right. I used to have one of these (like many of my plants, sadly now gone). Is the underside of the leaves a deep purple color? Yes the under leaf is a purply color, and it does do a yellow flower on spikes (sort of like hosta does the white flower.) Also, it is in a raised bed by the house.. Didn't know that it prefers the raised bed, but 3 of 4 of my beds are raised. Thanks.. When would you divide this, and do you divide it similar to dividing a hosta plant? I mean it starts coming up when the ground is still frozen and I am shoveling snow away from it.. By the time the ground is not frozen or muddy, it seems too established to divide. And the leaves stay big until the frost. It never seems like a good time to divide.. I moved mine once, but didn't divide it at the time. I don't remember what time of year, but probably fall after it quit blooming and when the ground was still warmer than the air. That's when I usually try to move and/or divide things. It did better in it's new location and didn't seem to mind being moved at all. Then the following couple years it sort of just got weaker and was crowded out by a monster bully shrub. I didn't get to it in time and the next year it didn't come up at all. That's about the extent of my experience with them. Every year I buy something I don't know about just to play with and this was one that was unsuccessful--I really didn't have a good place for it. Yours looks really good, maybe it likes your cooler weather. Mind never came up when we still had snow on the ground. With what you told me, I might move mine. I put daliahs in the bed with it this year. I put them in there before I had this plant in there, and wanted to start them up again. Those can crowd things out. I thought this plant was beefy enough to hold it's own. But, now you got me scared. I want to protect it. I had dahlias with mine, too. I don't really think they were the problem. The plants were situated on the back side of a berm that doesn't get a whole lot of attention--it faces away from our pool on a fenced side of our yard and I put plants there mainly to hold the soil on the steep incline. There are two burning bushes there, and I really think those are the ones that crowded things out. They are beautiful in the fall, but have really outgrown their boundaries. I have no idea how to prune them and really need to find out (can anyone tell me? ), but there's always something else that needs to be done and they get the least attention. When I just move something without dividing it, I usually dig a big chunk of earth with it so it doesn't even seem to know it's been moved. It worked great with this plant--it didn't even wilt or know it had been moved. Seems I remember these plants have specific needs? Maybe extra water and mostly sun with a little shade? Can't remember except that I moved it because I thought it had too much shade and put it where it got more sun and was watered every couple days. Perhaps I gave it too much water, but I still blame the bushes! We have burning bushes. My husband tends the bushes. He says he just prunes it like any other bush. Don't know if that helps. You may want to start a new thread with the question, so others with more knowledge can answer you. They are in a raised bed next to the house, and would cover the windows and outgrow the beds with out the pruning. Thanks! I really need to do something with them. We had a nursery put them in, and so far everything has gotten much bigger than they said it ever would. I'll have to read up about them or ask others and get right on that LOL! 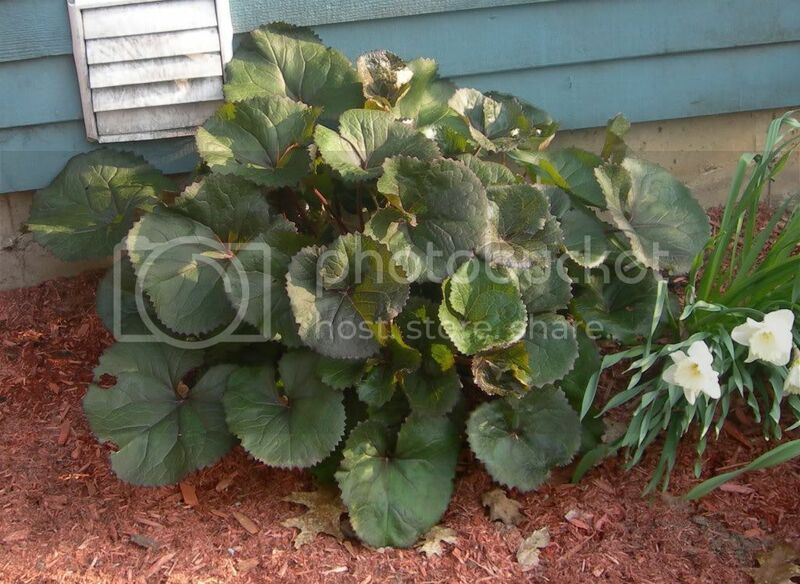 Just as soon as the spring clean up is done--I don't know how my yard is so much worse this year, but everything is a mess..
Ligularia dentata, likely 'Othello' or 'Desdemona' (the latter being not quite as dwarf, but hard to tell apart). Identify a beautiful plant please? ?